Dr. Indiana Solo Costume with a Threepio Golden Idol « Adafruit Industries – Makers, hackers, artists, designers and engineers! Attendees of Star Wars Celebration Europe brought it when it came to cosplay. Costumes covered a wide range — from original designs to replicas of costumes from Star Wars animated series and the films. Steven Woolfe went the mash-up route and dressed as Dr. Indiana Solo; the look combines Dr. Indiana Jones from the Indiana Jones films and Han Solo from Star Wars. It’s pretty much perfect, no? Steven was inspired to make the Dr. Indiana Jones costume while playing the LEGO Indiana Jones game. “In the Raiders of the Lost Ark section, Indy runs into rival archaeologist René Belloq after obtaining the Chachapoyan fertility idol. When Belloq demands Indy hand over the artifact, Indy tries to fool him with a C-3PO head. 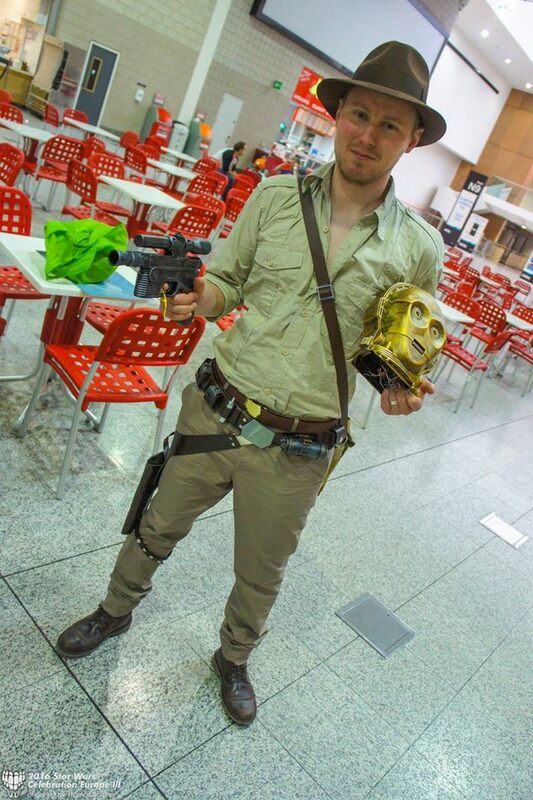 Originally, I wanted to attend Star Wars Celebration Europe in full Indiana Jones attire and just the C-3PO idol head, but since the convention did now for allow actual bullwhips, I ended up adding a lot more Han Solo gear, such as his weapon’s belt and blaster,” he said. The costume was put together over time. Steven spent two years completing his Indy costume, one piece at a time. To modify the ensemble and add Han Solo touches, he made Solo’s belt/holster and the C-3PO idol — he did both in the week before Celebration. 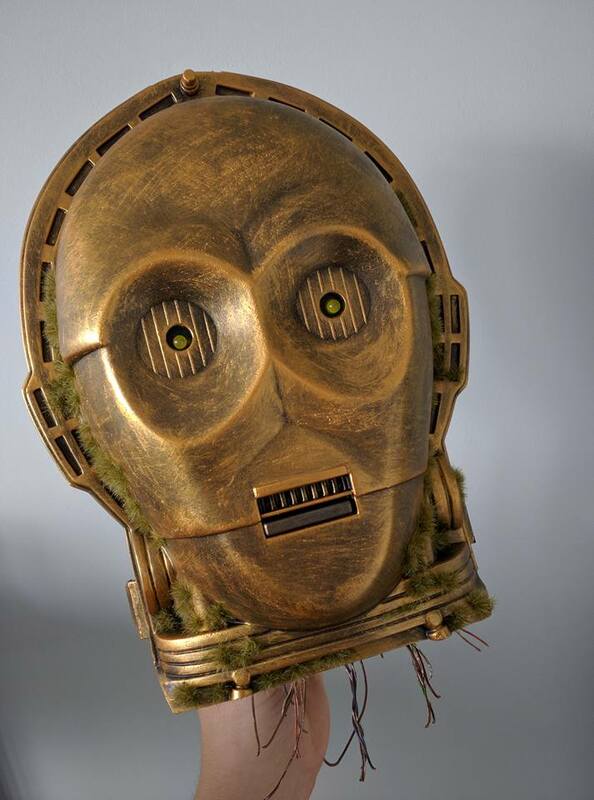 I’m especially taken with Threepio’s head as the idol; Steven did beautiful work with the weathering. 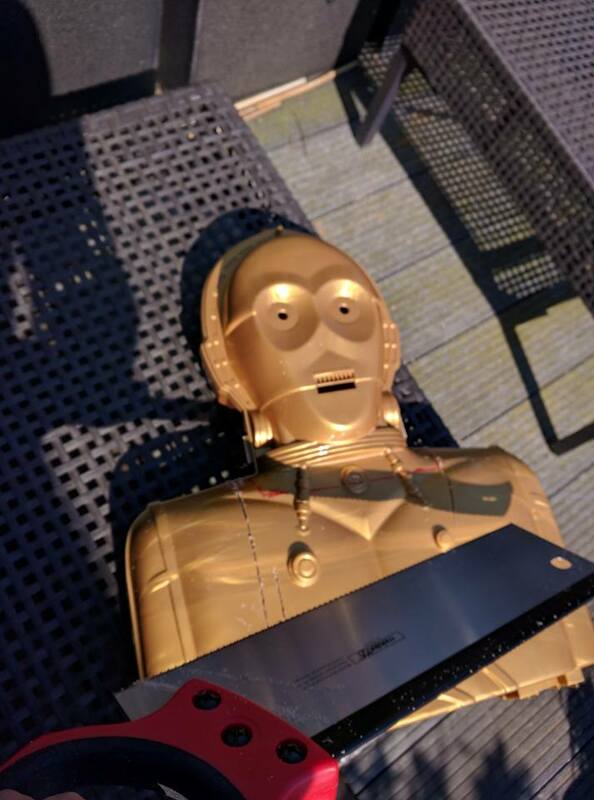 He said, “I really wanted the C-3PO head to look like it had been separated from its body by force and sitting in a temple on Yavin IV for a thousand years – a little rusty, the golden shine barely visible, wires bare and overgrown. But as most head replicas are too expensive to modify to such an extent, I went on a long search to find a good base for the head. After looking at cookie jars, bluetooth speakers and play sets, I eventually found a plastic 90’s action figure case on eBay for a reasonable price, voice box and light-up eyes still intact.” Huzzah for resourcefulness! Pieces acquired, he modified the toy case to make it look like an ancient artifact. After he removed the bust portion of the case, he applied sandpaper to the surface to make the texture rough and damaged. After that: “Matte black spray paint came next, followed by three dry-brushed layers of rust and gold paint to give it the desired weathered look. For the wires, I stripped an old internet cable, slapped multiple rust colors on its innards and glued the individual wires between two pieces of foam. For final detailing, I got sticky moss (the kind you’d normally use for war game terrain and miniature bases) and applied it along the edges of the head to create mossy jungle patches.” You can see a before and after of the Threepio idol below. See more Dr. Solo build pictures in this album on Facebook.